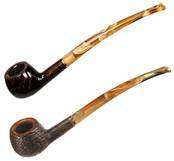 Red Lion Smoke Shop stocks a full and varied line of smoking pipes. Whether you want Briar, Meerschaum, Clay, or Corn Cob, you can find it here. Besides a full line of Standard shapes, you will also find Churchwarden, Calabash, Petite, and Mini pipes prominently displayed. Peterson, Ben Wade, Stanwell, and Chacom are only a few of the brand names you will be able to choose from.